11 days to go until Canine Carnival! CANINE CARNIVAL – The countdown is really on now! Saturday August 13. Jamesville Beach Park, NY (Syracuse). One of the largest animal rescue events in the country. 135+ rescues/vendors. Animal demonstrations, great food, music, educational sessions, Red Cross Bloodmobile and more. FREE ADMISSION. If you are interested in taking part as a sponsor, vendor, rescue or volunteer, please email. 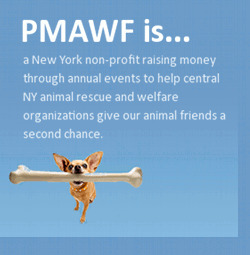 Go to www.pmawf.org Contact Us. This entry was posted on Wednesday, August 3rd, 2016 at 7:12 am	and is filed under Uncategorized. You can follow any responses to this entry through the RSS 2.0 feed. Both comments and pings are currently closed.